Things around our house have been quite chaotic lately. We are in the process of trying to either rent or sell our house, and that makes having a messy house a big problem. We (I) always have many projects going at once, Poesy has just discovered how to spread her toys allllllllll around, and Hope is my accidental book-leaver-outer (which is a problem when all of your school books live at home). We're a pretty untidy bunch. We try, but it would be helpful if just ONE of us was good at keeping up with organization. I mean, really... there is a sweater hiding SOMEWHERE in my bedroom and I cannot find it anywhere. It's driving me nuts. I just had it last week. This is Hope's Halloween costume that I've been working on. We bought the vintage dress off of eBay for $6 or so. Hope wasn't too sure about it because she wanted something with SPARKLE(! ), but I knew it could jazzed up quite a bit. I still have a sleeve to finish and a hat to make before Monday, but I'm so happy with the way it is coming together. And the most important part: Hope is happy with the way it is coming together! As she should be!!! It is super cute....and I am feelin ya on the untidiness. It lives at my home too. i like to use the saying "our house is well lived in" when it gets too messy. my husband doesn't usually buy that excuse. ;) she's going to look so cute!! All frustrations in life disappear with a bit of sparkle! Katie!! That dress is so beautiful!! I love the little tassels + all the sparkle!! I am sure Hope is going to look beautiful in it!! I hope all goes well with the house move my dear!! SO cute! Love all of the sparkle! Where are you moving? the halloween costume is ADORABLE!! you sound like my organization twin. we are a pretty messy/chaotic family here too. And I always alway loose clothes in my room that I swore I saw yesterday. and I saw the costume via IG already but I adore it! Is she going to be a majorette? then she needs a majorette baton! I wish I lived closer!!! I have a ton of batons!! (yes I was a twirler.... a tad embarrassing :] ) She is going to be the cutest little lady ever! You did such a great job on the dress! I can't wait to see it on her! And your house... don't sweat it. Yes, it's wonderful when it's clean and tidy, but with all that you do, it totally understandable if it's not 100% perfect 24/7. :] Don't sweat the small stuff. our house is always a mess... no worries! 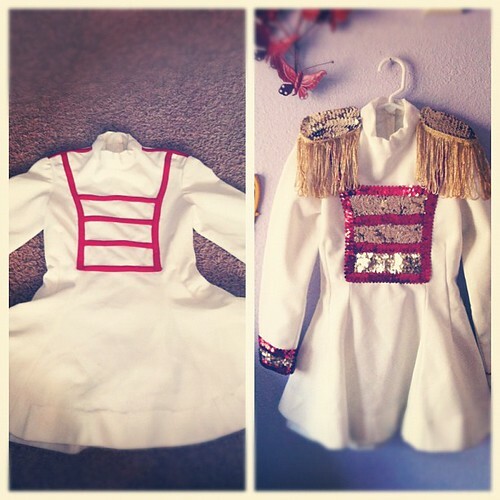 amazed at the progress of Hope's costume! i devote one room to mess. its key. The costume is looking awesome! Are you dressing up for Halloween this year? i LOVE how you blinged up hope's costume. i'm making my own costume too and i'm definitely stressing as it gets down to the wire!